Philadelphia Eagles linebacker Jordan Hicks left Monday night’s game against the Washington Redskins with what is believed to be a torn Achilles tendon. If true, Hicks will miss the remainder of the season and the beginning of his 2018 season could also be in doubt. Hicks, who graded as one of the top cover linebackers last season with 90.0 coverage grade, was off to a very slow start. His 47.2 overall grade on his 268 snaps this season ranks 54th overall among off the ball linebackers. While his coverage skills have remained his best skill this year, he has shown a major regression, earning a coverage grade of just 71.5 and allowing a catch rate of 80.9 percent into his coverage. Defending the run, Hicks has been very ineffective and currently possesses a run-defense grade of 40.4 that ranks 72nd out of 84 qualifiers. He has struggled with missed tackles this season, ranking 57th out of 62 inside linebackers in tackling efficiency, missing a tackle every 5.4 attempts. 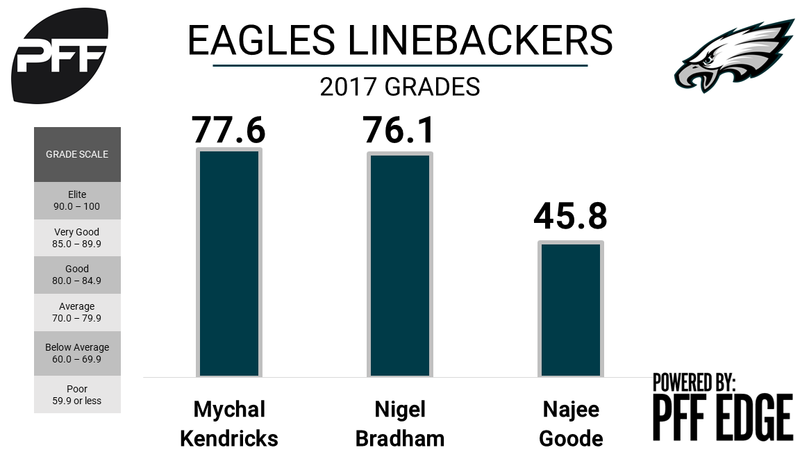 If Hicks does miss serious time look for Mychal Kendricks (77.6 overall grade) and Najee Goode (45.8) to fill his spot.